The story does raise a couple questions; such as, How can it be good to give away ‘everything you have to live on?’ What then? Then, somebody has to give to you so that you can survive. And also, two small copper coins aren’t going to pay the bills at the temple. Why doesn’t Jesus give a little credit to those who are giving enough to keep the heat and lights on? First of all, we need to look at what Jesus doesn’t say. For example, though Jesus does criticize some teachers of the Law (in previous verses), he does not speak ill of the wealthy members who are putting their larger gifts into the treasury. Nor, does he say everyone should put everything in, nor does he even say that the widow should have put everything in. Jesus did not say any of that. Jesus just said the widow put in more. More what? Certainly not more money, so Jesus clearly meant more of a percentage. This is the same message as in II Corinthians 8:12 where Paul said, “The gift is acceptable according to what one has, not according to what one does not have.” It is just basic Christian stewardship to give as you have been given. The other important lesson is that Jesus is watching. Verse one says, “As Jesus looked up, he saw” what people were putting into the treasury. Jesus saw them, and, he sees you. Jesus is watching when that offering plate goes around, and Jesus is watching you whenever and wherever else you have an opportunity to be generous. Think about that. This is not a threat. It is just a fact. Jesus knows all and sees all. Another fact is that people act better when they know they are being watched. This is certainly true of children, and it is also true of adults. It is true of everyone. We all behave much better, and are far more likely to do what is right, when we know we are being watched. Fifty years ago when I was a child, our church posted for all to see the total amount of money each person gave that year. Therefore, everyone was watching and everybody knew what everyone else gave– and you can bet that served as a powerful incentive. I don’t think that was a good idea, because it led to all kinds of pride and gossip and unholy thoughts and comparisons. So it is a good thing churches don’t do that anymore. But the most important One of all is still watching, still seeing. “Jesus is always watching over you,” we like to say, and that is a wonderful promise. It can also be a little unnerving. Jesus is watching? Yes. Always? Yes, always. Jesus even sees how you spend all of your money. Jesus sees how generous you are and he sees how selfish you are. One more thing. Giving to the Lord’s work need not be defined only by what one puts in the offering plate. There are many opportunities to share what you have been given by contributing to international mission or disaster relief organizations, by responding to local needs, or even by giving help to friends or family members who are struggling. The Good Samaritan was also serving God when he paid for the injured man’s room at the inn until he recovered. And of course, wherever we put our money, we must do what we can to make sure that what we give is used wisely. There are, of course, churches, organizations, and individuals are not very good stewards with what they have been given. One cannot expect to agree with every line in the budget, but we do need to put some thought and prayer into our decisions about how much money to give and where. 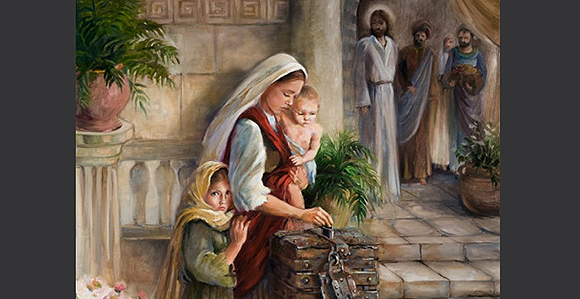 However you choose to give to God’s work in the world, the powerful lesson in this little story of the widow’s offering is that Jesus is watching what you do with what you have been given. O Lord, who hast warned us that thou wilt require much of those to whom much is given; and who in thy infinite love hast entrusted to us both the knowledge of thy truth and the gifts of thy bounty: Help us to use them as good stewards, giving liberally and working diligently, that we may share in bringing all people to thy truth; through Jesus Christ our Lord. Amen.